The health visitor came for a home visit recently, to talk about weaning B. Can someone tell me how on earth it’s time for this conversation already!? Didn’t I JUST give birth!? Apparently not. The time has come to start weaning him onto solids. B certainly has got a strong interest in what we’re all eating and is always trying to grab stuff out of our hands. There’s no doubt that he’s ready for food. We’ll be weaning in the same way we did with G, just because it’s what feels right for us. Starting with purees, first tastes will most likely be baby rice followed by veg and fruit purees. But we also encourage finger foods alongside this, but found that both boys are similar in actually wanting to eat rather than just play. It’s been really strange, because I’m so used to making stuff for G or giving him new things to try off my plate, that I’ve had to stop myself from doing the same with B sometimes, but now that the time is coming to give him food I’m struggling to remember what I’ll need and what to make! Luckily OXO Tot have sent us some really lovely things to get started with. Divided into two sections, it’ll be great to test out new flavours and textures with B. As I said we’ll do a combination of purees and baby led finger foods, so it will be brilliant to have options available at each meal time, without having to lay out several bowls. Less washing up! Always a winner! 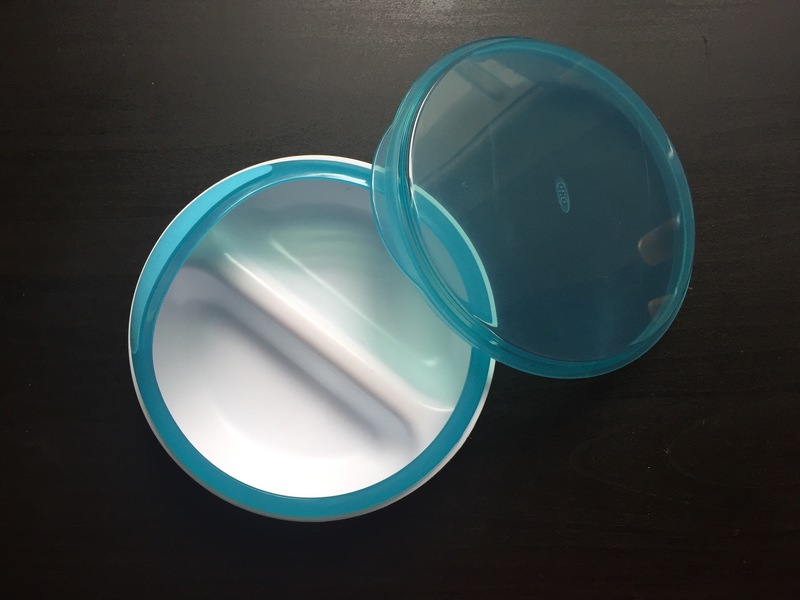 The bowl also comes with a clip on feature that will help to have somewhere to rest the spoon and help limit spills, again, a huge bonus. Another clip on feature is a lid. So they didn’t eat all the meal? no problem, because you can pop on the lid and store for later (using common sense and proper food safety of course!). 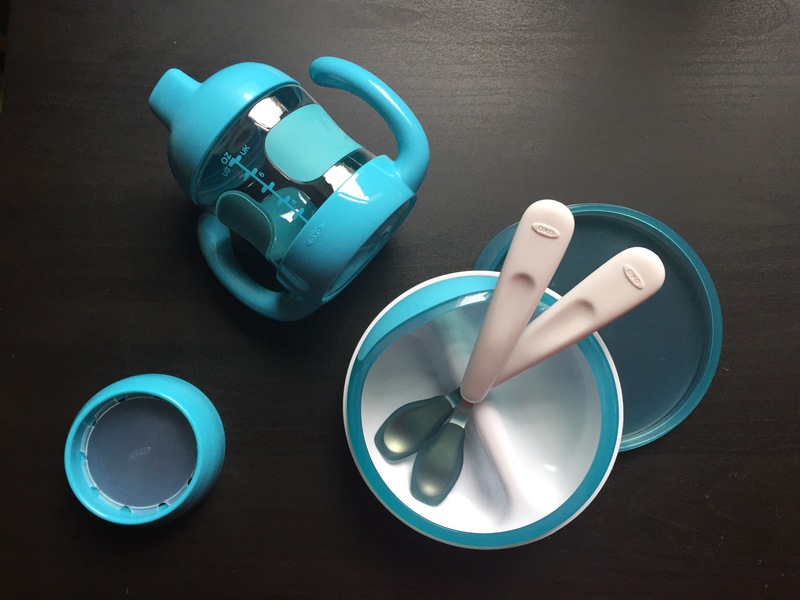 The bottom of the bowl has a grip on it so that when they start feeding themselves it won’t slip around the highchair tray or table. I love that they are ‘proper’ metal spoons, but coated to make sure they are soft and gentle on babies gums. 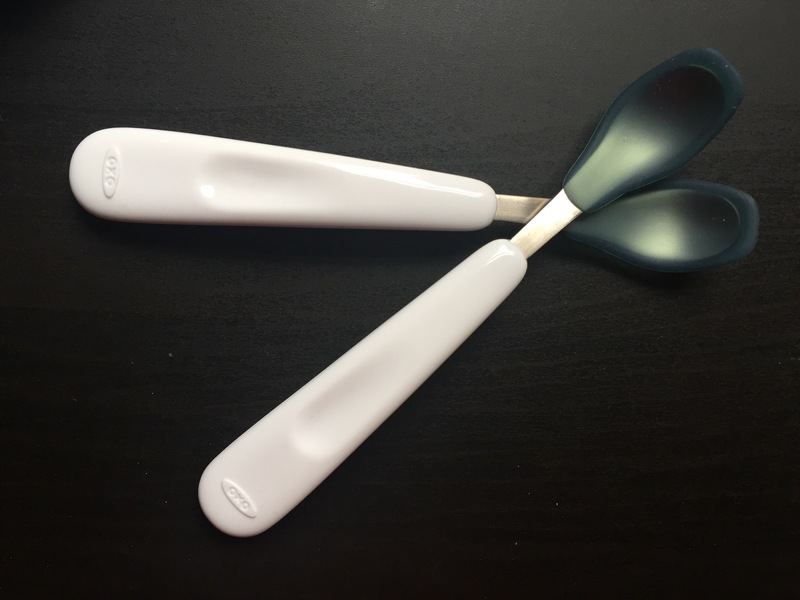 they’re not too wide or deep either, something I found was an issue when we were weaning G. The coating is super soft too, I found that even the plastic spoons seemed quite sharp or tough at times, so these seem a lot more gentle for delicate gums. Concentration will be on tasting the actual foods and not an uncomfortable spoon! Sounds simple but its a big deal to a small baby. I can’t believe it’s almost time to start giving B a little cup of water with his meals! G has kindly offered to test it out already, in the interest of “sharing”, and its great. Sturdy and easy to hold, and most importantly of course, it’s free flowing. 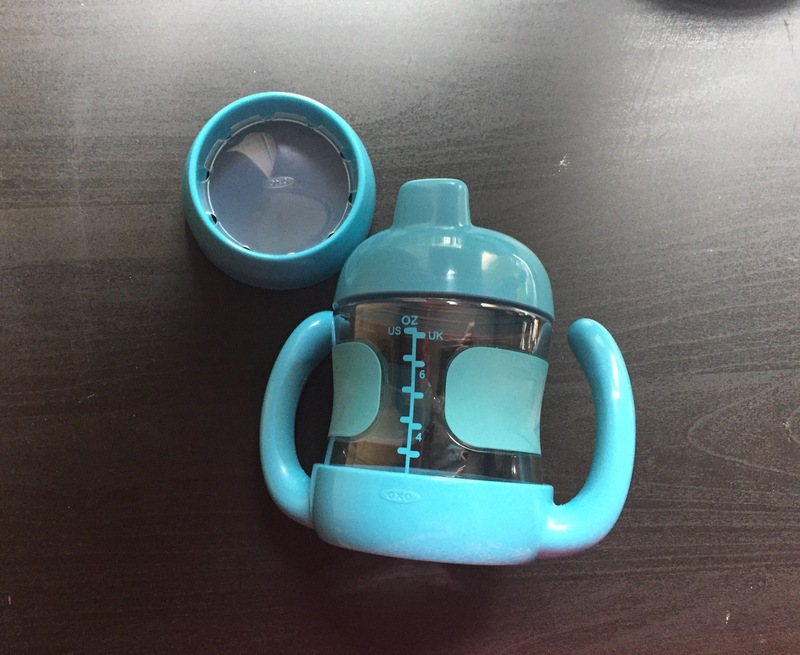 Like the bowl it comes with different attachments to change from a spout to a top that makes it more like a regular cup. 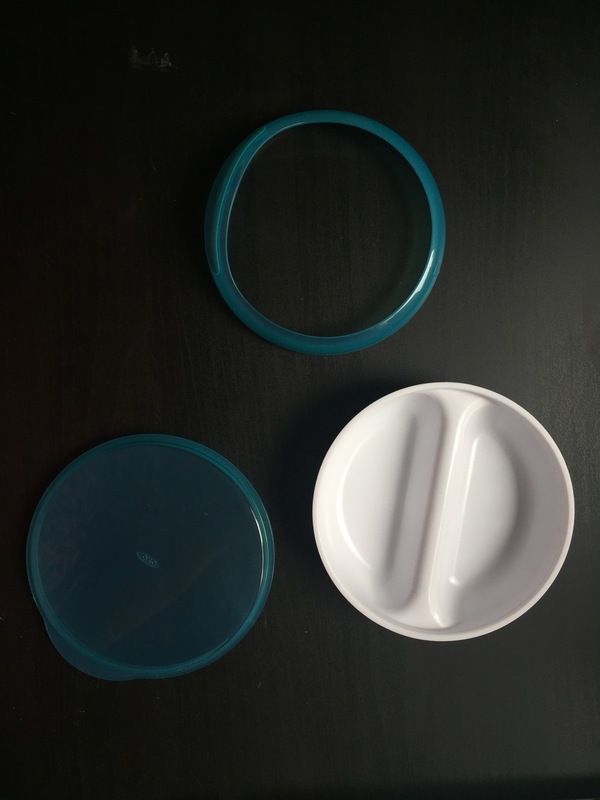 Apart from the fact that all items are really practical, and also come with additional extras too which will make them multi use and longer lasting, the most important thing? They look great! They’re a lovely turquoise and white combo, fun and bright but kind of stylish too. We bought a new stash of Nom Nom pouches to have ready for homemade purees and snacks, though I need a refresher course on what foods to try and when. I’m sure I had printed some sort of chart off when we weaned G and ticked off stuff as we went along. I’ll need to try and find something for B or I’ll be feeding him all the wrong things! It’s crazy how much you can forget! We still need to sort out a highchair as the one we have he’s not keen on, and of course we are going to need a huge pile of bibs! And to stock up on the stain remover and washing up powder! Is there anything we’re missing? 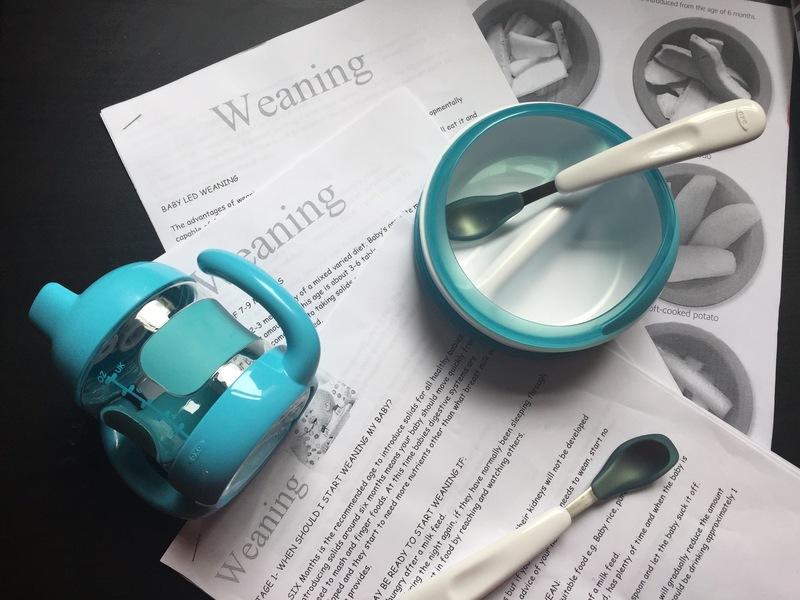 What are your weaning essentials?